It was a seriously demoralizing experience to read that the majority of Americans thought that Barack Obama gave a good State of the Union speech this week. Their approval may indicate that the process of the countryâs decline is more advanced even than I had feared. One of the only positive notes from this yearâs disappointing speech came when the President praised the (Republican) speaker of the House, his official host who sat grimly behind him â right beside Vice-President Joe Biden, who giggled like he was being tickled by a motelâs Magic Fingers device in his chair: Speaker John Boehner did not, as is his disturbing custom, burst into tears. No nation in history rose so quickly from obscurity to world leadership, and none since the Roman Empire has enjoyed such preeminence, as the United States. After playing a genius strategic hand from aid to the democracies in 1939-1941, the military conduct of the Second World War in the years following, to the containment strategy opposite the Soviet Union, until it was left alone as the worldâs only great power, the United States then suddenly became, in public-policy terms, an almost unrelievedly stupid country, about 20 years ago. During the Cold War, the United States led the triumph of democracy in Europe, South and East Asia, and Latin America â yet it now no longer ranks as one the worldâs better functioning democracies. âWe measure our progress by the success of our people,â progress that is partly âthanks to tax cuts we passed,â the President declared â referring to the Bush tax cuts that Obama tried fervently to end. In foreign affairs, âwe must defeat determined enemies wherever they areâ; and âour civilians will forge a lasting partnership with the Iraqi peopleâ; (it was at this point that I first wondered if the President had become a POW in the insane and failed American War on Drugs). He hailed âtougher and tighter sanctionsâ on Iran (though they are porous and completely ineffectual), and claimed to have ârevitalized NATO,â an alliance that is now completely moribund and confused, after 10 years of incompetent post-9/11 American leadership. The President recognizes that American corporations are grossly overtaxed, and he now favours the Colombian free trade agreement â stalled for years by the AFL-CIO and Nancy Pelosi, in their enthusiasm for the Colombian communist guerrillas and their drug-lord allies. Looking about at the members of Congress, most of them representing what amount to rotten boroughs, the President happily averred that âThere isnât a person here who would trade places with any other nation on Earth,â (unfortunately true). The replies were redundant, in any case: None of President Obamaâs aerated, flippant promises are believable in the slightest, coming from the most over-zealous regulator and profligate spender in the nationâs history. There was not a hint of policies to reduce oil imports, increase domestic oil production, reduce the cost of health care, cut spending (beyond a five-year freeze on 12% of budgetary outlays), pare entitlements, reform the tax system, reverse the (admitted by Obama) decline of education standards, reform the prosecutorsâ shooting gallery of a justice system, or grapple realistically with the debt bomb rather than just participate in a silent cabal with the European Union and Japan to devalue all of their currencies together, and thus reduce the debt (along with the net worth of all those who save or have fixed incomes). The United States is a rich country whose people are patriotic and hard-working. It is disoriented and very corrupt, and all its elites have failed. And yet it has no real rivals. Europe is crumbling, even more idle and debt-ridden than the United States, and withering demographically, almost comatose after generations of paying Danegeld to the urban mobs and small farmers. Japan is a geriatric workshop; Russia is an alcohol-sodden, self-depopulating gangster-state; and India, China, Brazil, and Indonesia comprise over 3-billion people, more than two thirds of whom live as they did 3,000 years ago. They are putting up good economic-growth numbers, but Chinaâs inflation rate is now in double digits, and all of those countries are largely dysfunctional, and will require decades to have any chance of seriously rivaling America. This should provide time for the United States to pull out of its nose-dive. President Obama said, âWe do big things.â The United States has, but after this presentational fiasco, I would not like to think of what he might have in mind for an encore. There is a role for Canada and Australia, countries that have most of Americaâs advantages except grandeur of scale, and few of its problems, to start to assume a bigger role in the world. The world wishes it, and we should be ready for it. Conrad Black, Baron Black of Crossharbour, OC, PC (Can. ), KCSG (born 25 August 1944) is an expatriate Canadian historian, columnist and publisher who was for a time the third largest newspaper magnate in the world. He was convicted of fraud in a US court in 2007 and sentenced to six and a half years' imprisonment. Despite the fact he is a crook I enjoy reading whatever he writes. 1)The US didn't become stupid 20 years ago,we've been fairly stupid from day 1. I won't go into details,but,we have. The disease was demonstrably bad when we voluntarily voted in an income tax under the mantra that it was just for wealthy folks. All that tells me is either everyone else is = or more stupid or for some reason God smiled on the Americans. 2) China is going to replace the US sooner than Conrad thinks. Just as experts overestimated Soviet power they are now overestimating China's power, in terms of GDP per capita China is not in the top 100 countries of the world. WarBicycle Wrote: Just as experts overestimated Soviet power they are now overestimating China's power, in terms of GDP per capita China is not in the top 100 countries of the world. I think that to be a common trait. It's fear of the possible. And too, it's the "quantity" over "quality" syndrome. Regardless the scientific knowledge and presence of 'supposed' high tech in a system, the entity is still built by command economic system, which almost completely leaves out many little detail which make for success. As a former tank commander, I naturally use this as a yardstick, and I am probably becoming quite redundant here. But I knew, back in the 1970s that all those thousands of Soviet tanks were not up to the task of defeating Western forces, which may not have been equal in numbers, were more than equal in quality. I don't see much to change my mind now. If China builds a winner in the Space Craft division, it will be so expensive, and hard to make in sufficient numbers, that it just won't have a severe impact. Economic competition is the main deciding factor, and China's Command Economy just won't get it over the mountain in the long run. Also, China is not going to remain one huge country in the end. National pride is nice, but it won't put syrup on your pancakes. I don't see what would prevent China from being great. Their people are nationalistic,they are very hard working and the governance is open for business mentality. They are well educated and desire more. Those virtues alone are pre requisites for greatness,not much else is needed. They have problems,we have some ,too. We just got a head start on them is all. A very small percentage of China's population is well educated, the vast majority of its citizens are peasants, and that is why they are over rated. I don't know about the % in China,I do know all Chinese I meet are highly educated . China is going to rule the world like Americans could only dream of in 1946,IMO,just a matter of time. They have 3X the American population and there appears nothing on the horizon to slow them down. I wouldn't put it past China to try and expand northward at Russia's Expense. They already have via immigration. It's a simple matter of time before the Russki far east border is exchanged to China for some small payment to save Russki face. They won't have a free hand,but,they'll replace the Americans as the global arbiters. WarBicycle quoting National Post Wrote: There is a role for Canada and Australia, countries that have most of Americaâs advantages except grandeur of scale, and few of its problems, to start to assume a bigger role in the world. The world wishes it, and we should be ready for it. I agree. The Anglosphere has a lot in common and as far as how the world looks, I don't think it looks much different as long as some combination of the U.K., U.S., Canada, Australia and Israel are in charge, perhaps in different areas or different responsibilites. We all act as a team. Always have (since 1914) and always will. WarBicycle Wrote: I wouldn't put it past China to try and expand northward at Russia's Expense. Exactly why playing Russia and China off against each other doesn't work. Their border area is desolate, unpopulated land. Very cold as well. If it's us or them, I choose us. Canada has done well minding her own business this last decade. She was wise enough to ignore the American call for war with Iraq,her economy is way ahead of the American's right now,her finances far better off. There's a lesson to be learned by Americans in how Canada has gone about her business the last decade. I hope Canadians don't fall for that "American disease" and start dreaming ambitiously outside their borders. Mad Max doesn't want Americans to hear the truth. I wish Trump would bring along a digital recorder and play back the crazy things they say. Talking about the wall, he could play back Obama, Pelosi, and Schumer praising building a wall and commenting how evil illegal migrants are. He could play back the words of VA Governor Ralph Northam supporting infanticide - not just the clips edited by the Leftwing media, and he could play back any issues the media have denied they ever said. There are so many things he could zero in on and prove it without waiting for the media. He could also carry a stop watch, and comment on how many minutes of coverage major stories were presented by various networks. and how some media never admitted some news at all. He could also play back the sentencing of the submariner who took photos pf his own workplace with no nefarious intent, and then play reports of Hillary committing felonies. I'm not sure if using a video or audio promotion is part of the rules of the SOTU. I could be wrong, but he needs to be doing this on a constantly recurring basis, everywhere he goes. 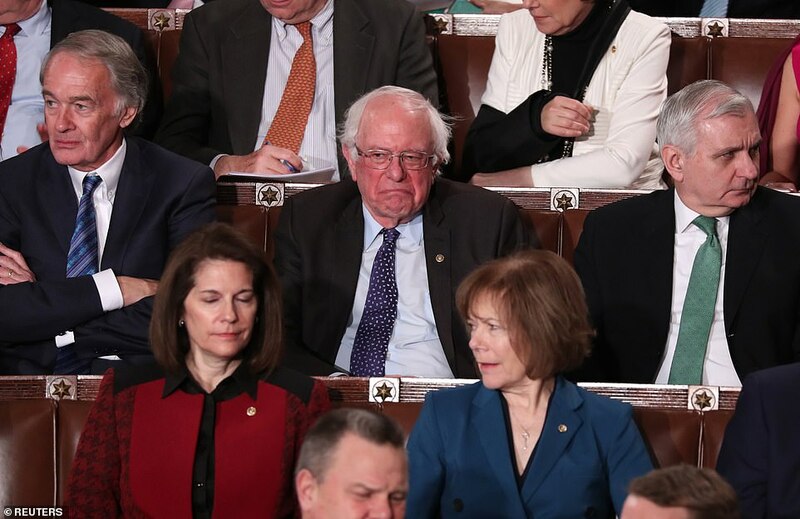 Trump Slams The Democrats During SOTU - "America Will Never Be A Socialist Country"
The Democrats did the Republicans a great service when they chose Nancy as the leader. Oh, I really like this shot. That is his "happy face".